Members of the 1st XV - winners of the Dewar Shield for the fourth time in the last five years. The club enjoyed a fabulous night on Saturday 2nd September, 2017 with the Annual Dinner and Ball held to celebrate the season. Nearly one hundred and fifty people from across the Senior and Junior club attended the Wattle Park Chalet in Surrey Hills. The evening started with the awards before giving way to club members mixing and dancing to the early hours. Some have asked why the event is no longer held at the club and the simple answer is the club is not large enough to cater for the evening. The evening also now boasts over forty percent attendance by ladies. Our women's team alone having twenty five players present and many of the hardworking lady members from the club in both Juniors and Seniors looking to celebrate their involvement with the club – as is seen by the winner of the Harlequin of the Year being Junior parent Sally Tracey. Many of you may not know Sally. She has three sons who have played at the club for many years: Oscar in U16, Xavier in U12 and Louis in U11’s. I have coached both Xavier and Louis in U8 (I think Louis was 4 or 5 at the time in the U8’s) and you have probably been served coffee by Sally’s daughter Lucy, our resident canteen Barista on Wednesday nights and Saturday match days. Over many years Sally has served as a volunteer within the Juniors in many roles: she was the junior club registrar for a number of years, transferring records online between the ARU and our own website and one must remember that Junior numbers are now up in the high two hundreds, over one hundred more than Senior registrations. 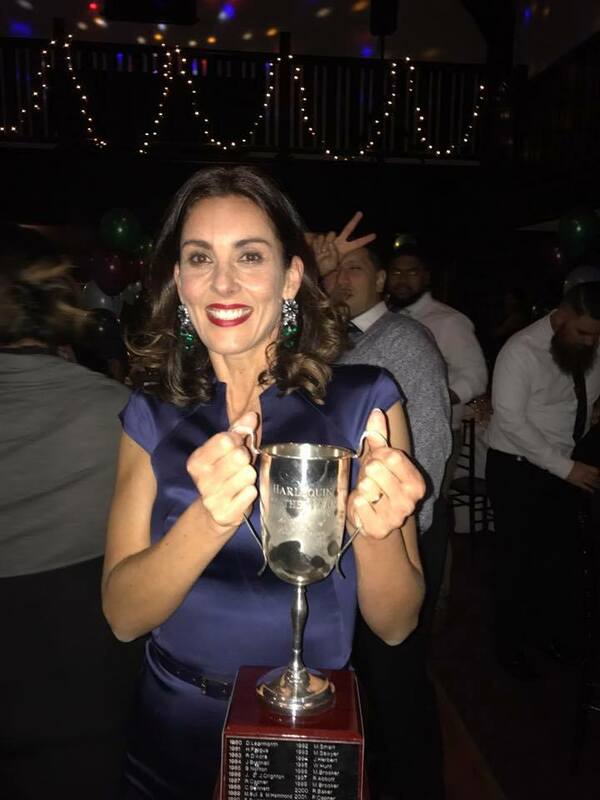 At present Sally is manager of both the Under 12 and the Uunder 11 teams and assists in numerous areas within the club's social and general club activities. A photo of Sally holding the Nick Driver Cup is attached and a very worthy winner of the award.